"AWEK’s Rich And Famous an international winner. Like the finest American blues bands, AWEK features a two fisted guitar and harmonica attack. [...]"
"Gritty Chicago harmonica, assertive, yet stylish guitarist, and polished originals which accurately cover American blues styles from Chicago's south side to gritty Texas shuffles to West coast jump make this record by the French band Awek is an international winner." 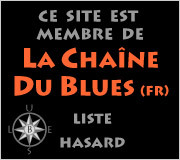 N°1 Powerblues CRB Blues 2012 june. "A 4-star rating" for "It's Rollin'..." in XROADS magazine for April 2010. "It's rollin" was the most frequently played album on the CRB for 2010. "Burnin' Wire on South Lamar"
N°1 Powerblues CRB Blues 2007 november. "Just Pick Up The Pieces"
Best cd 2004 by CRB Blues.